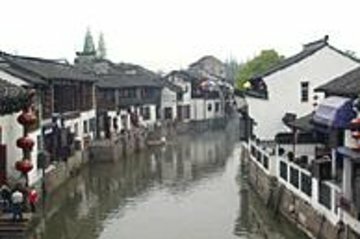 Depart from your Shanghai hotel in a comfortable, air-conditioned coach and enjoy the scenic journey to Zhujiajiao. On arrival, embark on a guided walking tour of the town with your knowledgeable guide; meander through winding streets parallel to picturesque waterways and learn about the rich heritage of the perfectly preserved village. See the area from an alternative perspective on a tranquil river cruise and then visit two of Zhujiajiao’s sacred and significant temples; listen as your guide explains the cultural significance of the structures and then venture to a silk shop to see an intriguing silk making demonstration. After you enriching 4-hour tour, return to Shanghai in your air-conditioned coach. I did this tour because I was traveling alone and unsure about transit. I realize now that it would have been more enjoyable to take the train and wander by myself. Guide was knowledgeable but left me behind - walked too fast most of the time so I felt rushed and the silk “factory” was unexpected and a total set up. I ended up in the company of an aggressive sales person with no one to translate or help me understand what transaction cost was. The Watertown was fine, silk thing a scam. Do not recommend. We had our guide Michael and our person of contact Jane who were both absolutely wonderful. The guide was super informative and gave a thorough history of the town and the religions of China through the tour. The tour group itself wasnt large, so it was very intimate and you were able to really see some of the older Chinese culture that you cant appreciate in the city. After the tour you are brought to a show room for Chinese silk and shown how silk is made. The staff in the showroom are very friendly and eager for you to buy their products however, they do not make you feel significantly uncomfortable about it. The only parts about this tour thatare tough is the traffic during the ride there and back, which, in one of the most populated cities in the world you cant avoid. Additionally, if you purchase anything from the silk showroom have the staff go over your receipt with you. I had thought that I was overcharged for something but instead I didnt realize the breakdown so have them explain it to you in detail. Additionally, it is a government facility so expect an automatic tax charge on your product of about an extra 30.00 American. When we thought we had an issue, our tour contact Jane was on top of our concerns and willing to help us verify everything was ok. Between our tour contact and our tour guide, we couldnt have had a better experience. Keep an open mind, maintain patience with traffic, and verify your receipts and you will love it too. For a half day tour I did enjoy visiting Zhujiajiao Water village but the drive was made longer by bad traffic, what should have taken an hour, took an hour and a half each direction. It turned out to be a private tour for me as I suppose no one else was signed up on the day I took it, so I had the guide to myself and we were driven there by a driver in a nice car. The Water Village and gardens were good but maybe not as extensive as I thought, it's more an old section surrounded by the more modern buildings. The guide Alina was good but I also feel that she could have told me more history/info especially as it was just the two of us. When we got back into the centre of Shanghai I was taken to a Silk 'factory' though it was actually just a big shop that showed you how silk is made. This is definitely a stop to get you to buy something and felt awkward for me. Generally though, I would recommend this bearing in mind that it is just a half day tour and it was a convenient way for me to get there. Not to far driving and not to commercial. Better than the daytour to the water villages. Price as OK for this tour. My review is about the actual tour - and not about the guide or the driver. They were both terrific, the van was very clean and air conditioned, and the guide was terrific - very friendly and informative and spoke very good English. I have given it TWO STARS because the actual tour just isn't worth the outrageous ticket price. You get taken to Zhujiajioa which is actually just a glorified shopping area and you'll spend your first hour just being dragged around the usual market shops selling Made in China and street food. We made the most of it and just played along, but seriously if you want to go - there's a ticket office onsite and you can buy your own ticket for 80rmb. We paid 120 aud each. It's a bit of a joke. You go on a gondola ride through the water ways which was kinda ok, but the very best part was when the gondola broke out of the Zhujiajiao water ways onto the main river and you got a much more expansive and genuine view of the area and the local people, but sadly that only lasted for two minutes. It showed to me that it was a really interesting rural area but they didn't show us that. Just the shops. The most disappointing thing was the wasted opportunity for the operators to do a more genuine and insight tour of the river community and the area rather than just the historic market stalls trying to sell stuff you can get anywhere in Shanghai. Frank our guide was very personable and friendly. He made everyone feel welcome and had an excellent command of the English language. The village was busy but he was able to move us through the crowds and had a natural timing that placed us in places throughout the Village that less populated or empty. It was at those points he told us some very interesting historical details and was inviting to questions and comments of all tour members. Highly recommend this tour. Creepy guide therefore not a pleasant drive. Not authentic as the town is just for tourists. Very disappointing. Excellent trip. The guide arrived on time around 12:30PM at the hotel with a well kept SUV. We drove to the Water Village and the guide was well informed and patient during the trip and helped us with some graet pictures. Would recommend it anybody interested in doing this half a day trip without missing anything.